CHICAGO — Chicago’s rat problem just became serious for the executives at Wrapports, the company that publishes the alt-weekly magazine, the Chicago Reader. 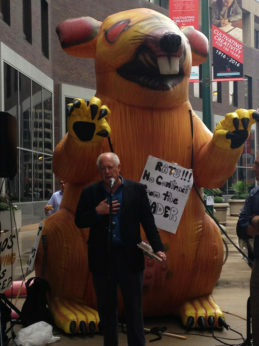 Scabby the Rat, perennial symbol of worker’s discontent, was on hand in downtown Chicago for a rally where the staff of the Chicago Reader, together with community, demanded that the publisher come to the table and negotiate a contract after leaving workers in limbo for over a year. In addition to cross-union solidarity facilitated by the Chicago Federation of Labor and music by alt-country pioneer John Langford, the rally featured a heartening détente between natural enemies, journalists and elected officials, all in the name of fairness at work. 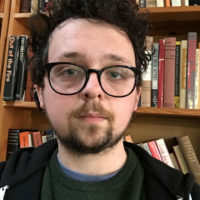 “I have been on the receiving end of Ben Joravsky’s pen before,” said Alderman of the 42nd ward Brendan Riley about the widely respected Reader journalist, “and that’s why I’m here, the Chicago Reader has played a key role in holding our government here in Chicago accountable.” Joravsky’s exposés on Tax Increment Financings (TIFS) and their use/misuse in the city of Chicago have elevated TIF reform to a high profile issue for the city. Among the other elected officials on hand who have received lashings from the Chicago Reader were former Illinois Governor Pat Quinn, Ald. Carlos Ramirez Rosa of the 35th ward, and Ald. Ameya Pawar, who thanked the Reader for its coverage of his small campaign in the 47th ward in 2011. “Ben Joravsky gave me print when no one else in the city took my campaign seriously. “Over the years, we’ve had our jousting sessions but the point is that he took a chance,” said Pawar. Aimee Levitt, staff writer at the Chicago Reader and author of the piece that exposed the abuse that took place at Chicago’s Profiles Theater and that led to its closure, addressed the crowd about everything it takes to put out such an impactful piece. “The abuse taking place at Profiles was an open secret and we weren’t the only paper that the victims talked to but we were the only paper that would publish the story,” said Levitt before naming and thanking members of the staff who worked tirelessly into the night but whose names don’t make it to the cover. Levitt and her fellow co-workers have not had raises in a very long time, some for more than 10 years, resulting in an effective pay cut, as Ald. Rosa pointed out during his speech. What’s more, the Chicago Reader appears to be a microcosm of the national gender gap in salary. Ben Joravsky, one of the Chicago Reader’s elder statesmen, pointed out that he’s been a writer with the Reader since the Reagan administration after being called upon to give the final speech by the crowd. 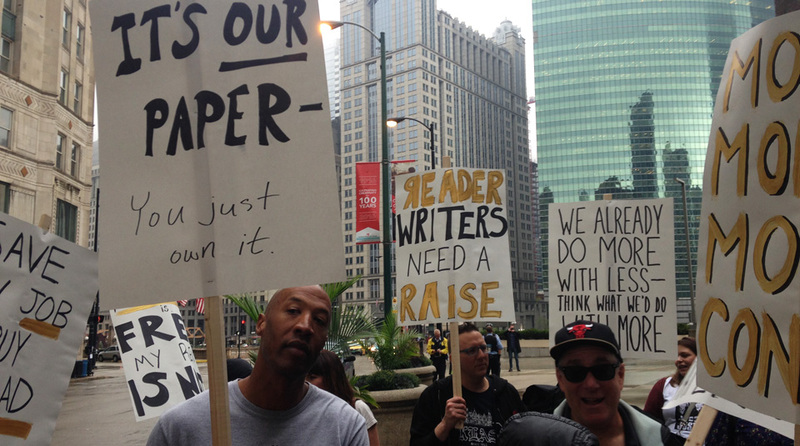 People’s World will continue you bring you coverage of the fight for a fair contract at the Chicago Reader. If you’d like to support them, click here to find their campaign’s Facebook page and here to sign their petition to Wrapports.